TCR engagement with peptide/MHC complexes displayed on the surface of the antigen-presenting cells is the crucial event in developing an adaptive immune response and occurs within specialized signaling areas named immunological synapses. 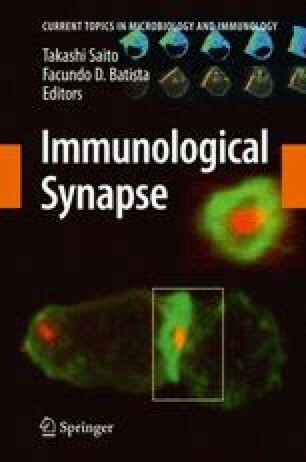 Immunological synapses are diverse both in structure and function and exhibit a strikingly dynamic molecular organization. In this review, we focus on the diversity of immunological synapses and on their plasticity in response to stimulation. We discuss how the study of the adaptable features of immunological synapses can be instrumental to a better understanding of the complex regulation of adaptive immunity. This work was supported by grants from la Ligue contre le Cancer (“Equipe labellisée 2009” to SV) and a Marie Curie Excellence grant (European Community contract MEXT-CT-2005-025032 to LD).